Fiscal hawks in Congress are pushing to end a federal energy tax credit for the wind industry set to expire at the end of the year. Rep. Mike Pompeo (R., Kansas) and 51 other members of the House are asking the House Ways and Means committee not to renew the wind energy production tax credit (PTC). "The growth in wind is driven not by market demand, but by a combination of state renewable portfolio standards and a tax credit that is now more valuable than the price of the electricity the plants actually generate," Pompeo wrote in a letter released Thursday. "As the House Ways and Means Committee takes on the commendable, but difficult, task of enacting revenue-neutral tax reform legislation, the PTC should be excluded from there or in any tax extenders legislation that the committee may consider." Pompeo sent a similar letter last year with 47 signatories. This year’s letter has 52 signatures, including Nick Rahall (D., W.Va.) and Rep. James Lankford (R., Okla.), a member of House leadership. Congress first enacted the wind energy PTC in 1992 and has renewed it seven times since. It gives wind producers 2.3 cents per kilowatt hour and is projected to dole out $12 billion in tax credits over the next decade. The tax credit has faced an uncertain fate amid the recent fiscal cliffs that have plagued Congress over the past couple years. The wind PTC expired for one day at the beginning of 2013 before being revived as part of the last-minute fiscal cliff deal. However, Congress has not started working on a package to extend tax credits at the end of the year, according to news reports, making it unlikely the wind PTC will survive. Opponents of the wind PTC—a coalition of free market groups, fiscal hawks in Congress, and energy industry interests—say the tax credits distort markets and are no longer needed after two decades of federal support. Pompeo also introduced legislation earlier this year to end all energy tax credits. Pompeo’s bill garnered the support of a host of free-market groups such as Americans for Tax Reform, Club for Growth, Americans For Prosperity, and the American Energy Alliance. The wind industry argues the political environment is creating uncertainty in the industry, leading to a slowdown in new projects. According to the wind industry, it invested nearly $25 billion in new turbines 2012. The wind industry installed only one turbine in the first half of 2013. "This congressionally sanctioned uncertainty has hit the nation’s wind industry incredibly hard," the Governor’s Wind Energy Coalition wrote to congressional leaders in a Nov. 6 letter. 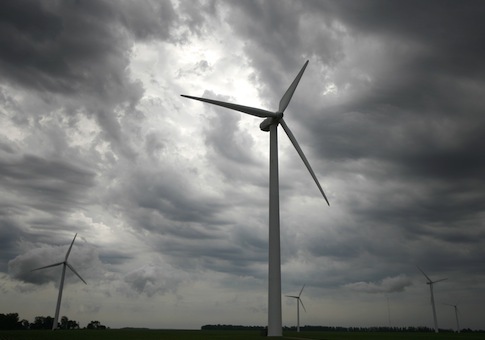 The American Wind Energy Association is also pushing hard to ensure the tax credit survives. AWEA also says the political environment is creating uncertainty in the industry, leading to a slowdown in new projects. "We must, as a country, get out of this unpredictable, uncertain pipeline environment," the association’s CEO Tom Kiernan told Politico earlier this month. AWEA spent more than $2.1 million to lobby last year for the wind PTC, a 61 percent increase from the $1.5 million it spent the previous year. As previously reported by the Washington Free Beacon, wind turbines in California frequently decapitate golden eagles. This entry was posted in Issues and tagged Green Energy, Mike Pompeo, Wind Energy. Bookmark the permalink.